In the crass, cynical world of show business, Kermit the Frog is a celebrity cut from a different cloth. Over the course of his remarkable career, which spans more that 50 years, Kermit has proved himself to be a frog of all trades: Actor. Reporter. Author. Musician - there's nothing he can't do. But it's Kermit's kindness and gentle leadership that have made him a Hollywood legend. 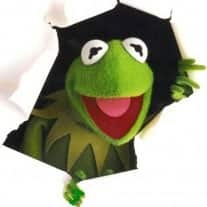 As the director and host of The Muppet Show, Kermit helped other stars like Fozzie Bear, Gonzo, The Swedish Chef, and of course, Miss Piggy, encouraging them to be the best they could possibly be. Now, Kermit is back on the big screen for the first time in 12 years and reunited with his Muppet show cast, with the release of their movie, "The Muppets".